I suggest that readers do some exercises on solving various problems springing up on the chessboard and compare their standpoints with the opinion of one of the best players in the world. We will not examine the whole games. Here we have another goal – to concentrate on critical moments of the struggle. I understand that our task is not easy, but still I recommend you not to rush to the text following a diagram. Try to evaluate the position by yourself at first, calculate necessary variations and find the best continuation. All the positions are divided into subject groups; in some cases that will be a prompt for you, but not always. So let us begin – play like Vladimir Kramnik! 1. Struggle for the initiative in the opening. 16.Ґe3! You cannot find a better square for the bishop, but what about the a4-pawn? Accurate calculation is the basis of making a correct decision. 16...¤xe4?! 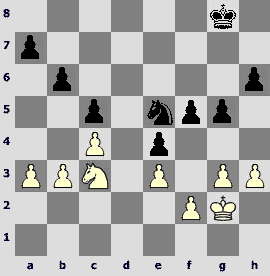 the threat of 17.dxe5 makes Black define the situation in the center. In case of 16...exd4 17.Ґxd4 Ґxd4 18.cxd4 nothing is gained by 18...¤xe4?! once again due to 19.Јxb7 ¦ab8 20.Ґb5! Now it won't work to move 20...Јf5 21.Јxc7 ¤h4?! 22.Ґxe8 ¤xf3+ 23.gxf3 Јg5+ 24.ўf1 ¤d2+ 25.ўe2 ¦xe8+ 26.ўd3ќ, and in case of 20...Јd8 21.Јc6± White has obvious advantage. After the best move 18...c6 White keeps his advantage as well. 17.Ґb5! c6 18.Ґd3. All black minor pieces hang. 18...exd4 19.Ґxd4 Ґxd4 20.Ґxe4 ¦xe4. Otherwise Black loses a piece. 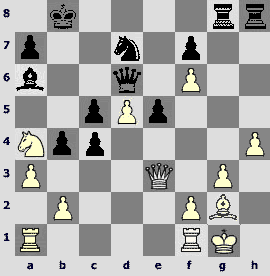 21.¦xe4 Ґf6 22.¦ae1±, and White has converted his extra exchange. 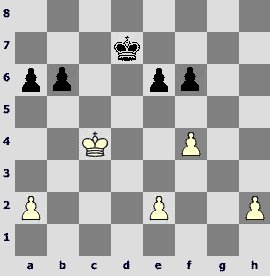 The position is approximately level, and nothing seems to threaten White. 12...h6! 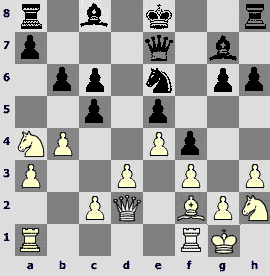 Potentially black pieces excel its counterparts in activity, and this circumstance, although not so obvious, makes it possible to think about advance of black K-side pawns under conditions of undefined situation in the center. 13.¦e1? White has underestimated Black's idea. He should have played 13.¤fd4, and if 13...g5 14.Ґg3 ¤e4, then 15.f4! with complex play. 13...g5! 14.Ґg3 ¤e4 15.¤fd4 f5! 16.Ґh5 (16.f3 ¤xg3 17.hxg3 Јd6µ) 16...¦f8 17.h3.If 17.f4, then 17...g4 18.ўh1 Јd6! with a threat of 19...¤f6. 17...¤xg3 18.fxg3 Јd6µ with black advantage. 2. Tactics and calculation of variations. 19.¤xf7! A simple but elegant combination. 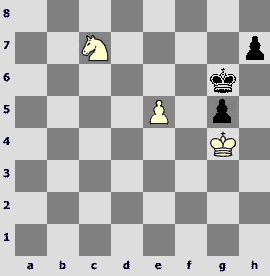 Black king is in a sad situation, and that creates necessary premises for a forced solving of a position. 32...¦h5! 33.¦7d6. White counts on this move, but he has underestimated Black's reply. 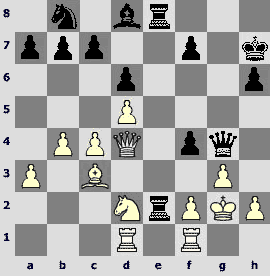 33.Јg4 ¦g5 34.Јh3 Ґe5 35.Ґf1 e2° does not save White as well. 33...Ґf6! An important intermediate move. 34.¦xf6 (34.Ґd3 Јg7 35.Јg4 ¦g5°) 34...Јc2! An unexpected and very fine move. White is ready only for 34...¦xh3? 35.¦xg6 ¦xg6 36.¦d4 with an approximate equality. A piece here is certainly stronger than three pawns, but the outcome is still up in the air. 24.¤b6+! A fine tactical blow, the consequences of which have been precisely calculated. 24...axb6 25.axb6 ¤a6. Loses 25...¤xe6? 26.¦a1# or 25...¦e8? 26.bxc7 Јxe2+ 27.Јxe2 ¦xe2+ 28.ўc1ќ. 25...¦h8 26.bxc7 Јxc7 27.¦d7 allows to protract the resistance. 26.¦a1. Principal threat is 27.Јe7 with following 28.¦xa6+. 26...¦d8. In case of 26...Јf2? 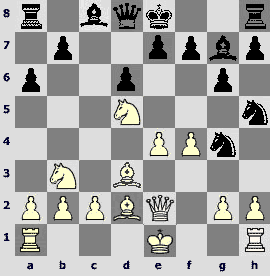 the control over the b8-square is lost, so the issue is decided by way of 27.¦xa6+ bxa6 28.Јxc6+ ¦b7 29.Јc8+ ¦b8 30.Јxa6#. Of no help as well is 26...Јe5 27.¦xa6+ bxa6 28.Јxc6+ ¦b7 29.Ґf3ќ. 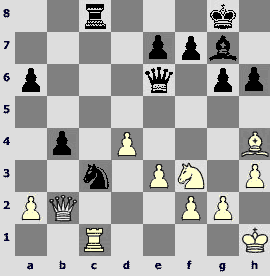 27.Јe7 Јd6 28.¦xa6+ ўb8 29.Јxd6+ ¦xd6 30.¦a3 c5 31.¦b3ќ, and White has comfortably cashed in on the extra material. 25.Ґc7! An introduction to a decisive combination. The bishop is to join in with the attack from d8- or d6-squares at the right time. 25...¦a8. 25...¤b6 26.¤f5 leads to a dismal situation. 26.Ґxf7+! ўxf7 27.Јa2+ ўf8. If 27...ўf6, then 28.Ґd8+! ўe5 (28...¦xd8 29.Јe6+ ўg5 30.¤f3+ ўf4 31.g3+ ўxf3 32.¦d3+ќ) 29.¤f3+ ўf4 30.Јd2+ ўg4 31.h3+ ўh5 32.g4#. 28.¤e6+ ¦xe6 29.Јxe6. 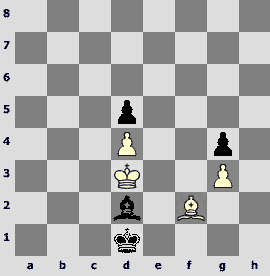 Black cannot prevent rook's joining in along the third rank. It is evident that Black has strong compensation for an exchange. But how to utilize the pair of bishops' power? 33...Ґb2! A subtle intermediate move. Immediate 33...Ґe5 34.g3 Јf3 35.¦xd5 Јxd5 36.¤d7! 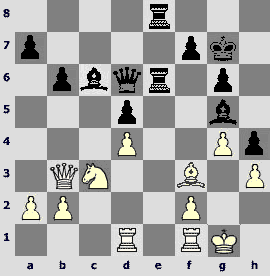 Јxd7 37.Јxe5 would have left Black with negligibly small chances for victory. 34.¦c2.If 34.¦b1, then 34...Ґe5 35.g3 Јf3 36.¦xd5 Јxd5 37.¤d7 Јxd7 38.Јxe5 h4! with black advantage. 34...Ґe5 35.¦xd5. 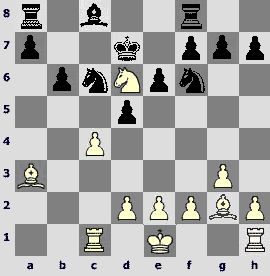 As it turns out, after 35.g3 Јf3 36.¦xd5 Јxd5 the variation 37.¤d7? Јxd7 38.Јxe5 Јd1+ doesn't work already, and so Black has already acquired a great advantage. 35...exd5 36.¤d7 (36.g3 Јf5µ) 36...Јh2+ 37.ўf1 Јh1+ 38.ўe2 Јxg2! 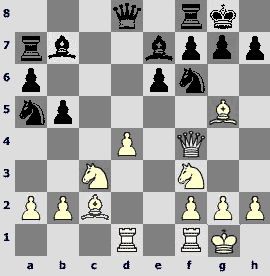 39.¤xf8.If 39.¤xe5, then 39...¦e8 40.ўd1 Јxh3µ with a strong attack. 39...ўxf8µ. 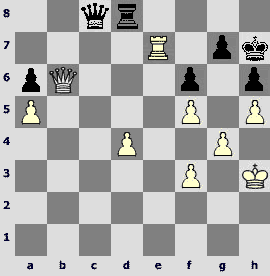 Black has already two pawns for an exchange, and white king needs constant attention. With his last move Black has left his g7-pawn under attack. Taking it seems risky, and the consequences are impossible to evaluate without precise calculation of variations. 21.Ґxg7! In case of 21.Ґd6 f5 White's advantage is minimal. 21...e5 22.Ґf3! Exactly so. 22.h3 ¤xf2! 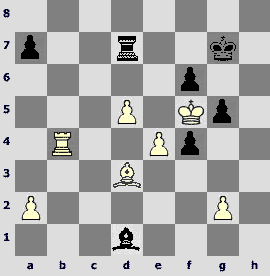 or 22.Јf3 f5 will be more than acceptable for Black. 22...f5. On 22...¤xh2 there follows 23.Ґxe5ќ, and the special appeal of the calculation is that on 22...¤xf2 there is an intermediate 23.Ґf6! ¤xd1 (23...¦e6 24.ўxf2 ¦xf6 25.Јxe5ќhas no prospects; from this branch it becomes clear, why 22.Ґf3 is stronger than 22.h3) 24.Јd2!ќ. 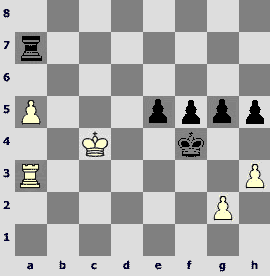 23.Ґxg4 d4 24.Јc1 fxg4 25.Ґf6±, and White is left a pawn up. 45...Јa6+! Black seeks to transpose the game into a favorable ending, but before exchanging the queens he adds another important touch. 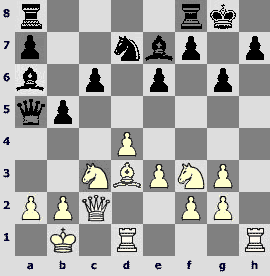 Straightforward 45...Јg6 46.Јxg6+ ўxg6 47.¦e6+ ўf7 48.¦a6 would most probably lead the game to a peaceful haven. 46.ўg1. Unsatisfactory is 46.ўe1 Јa5+ 47.ўf1 ¦c1+ 48.¦e1 ¦xe1+ 49.Јxe1 Јxe1+ 50.ўxe1 a3° or 46.¦e2 a3 47.Јh5+ ўg8 48.Јe8+ Ґf8°. 49...¦c4! White faces troubles because of the unfortunate position of their king. 50.Ґd6. Bad is 50.Ґe3? f4 51.Ґf2 ¦c1+ 52.ўh2 Ґe5°. In case of 50.¦a7+ ўe6! 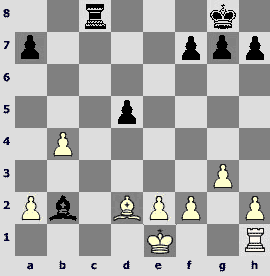 51.¦xg7 ¦xf4µ Black has fine chances to win in the rook ending. 50...Ґd4+ 51.ўf1 ўe6!µ, and Black has managed to win in the end. 4. An attack on the king. 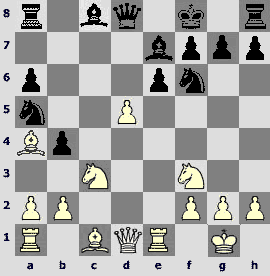 In the positions with opposite side castling it is necessary to act aggressively. 15.¤e4! Another piece joins in the attack. After 15.¦h6 b4 16.¤e4 Ґxd3 17.Јxd3 ¦fc8 18.¦dh1 ¤f8 White has nothing special. 17.¤xh7! Sparing no material for destroying the opponent king's pawn shelter. 17...c5. The main line of the combination is 17...¤xh7 18.¦xh7! (18.Ґxg6?! ¤f8›) 18...ўxh7 19.Ґxg6+ ўg7 (19...fxg6 20.¤e5ќ) 20.Ґxf7! ўxf7 21.¤e5+ ўe8 22.Јg6+ ўd8 23.Јxe6 ўc7 24.Јxc6+ ўb8 25.¤d7#. 18...b5! With this pawn sacrifice Black opens the file for his attack. White king gets scared. 19.Јxb5. No better is 19.dxc5 ¤xc5, or else c5-c4 will follow. 19...¦ab8 20.Јa5 ¦b3 21.ўa2?! An inaccurate move, but even the best 21.ўa1 c4 22.¦c1 ¦c8 23.Ґc3 ¤b8!? promises White no cakes and ale. 21...¦fb8 22.¦b1 e5! 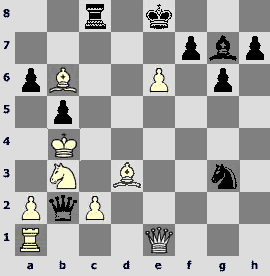 Black queen joins in the attack with decisive effect. 26...¤c3! An elegant mating combination crowns the game. There is a double-edged situation typical for the Botvinnik variation, but there is also a sensation that White is ahead of his opponent. 23...¤xc5. Also hopeless is 23...Јxc5 24.Јxc5 ¤xc5 25.axb4 c3 26.bxc5 Ґxf1 27.¦xf1 cxb2 28.¦b1 – connected passed pawns in the center decide the outcome in favor of White. 24.axb4 ¤b7. If 24...¤b3, then 25.b5! ¤xa1 26.¦xa1 Ґb7 (26...Ґxb5 27.Јxa7+ ўc8 28.Ґh3+! Ґd7 29.Јa8+ Јb8 30.Јc6+) 27.Јxa7+ ўc8 28.Ґh3+ ўc7 29.¦a6! with a win. 16.d5! 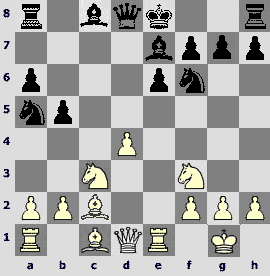 A classic example of an attack on a king stuck in the center. 16...exd5 17.Јf5! It was very important to foresee that move. 17...dxe4. Black accepts the gifts on principle. In case of any other answer there can be no doubts with evaluation of the position. 18.O-O-O ¦c7. If 18...Јc7, then 19.Ґg4 ¤e5 20.¦he1 ¦d8 (all the rest is still worse: 20...¤d3+? 21.¦xd3; 20...Ґb7 21.¦xe4! Ґxe4 22.Јxe4; 20...Ґd6 21.¦xe4 ўf8 22.¦xe5 Ґxe5 23.¦d7) 21.¦xe4 ¦xd1+ 22.Ґxd1 Ґd6 23.Ґf4 Ґc8 24.Јg5 Ґb7 25.¦e1±. 19.Ґg4! Ґb5. 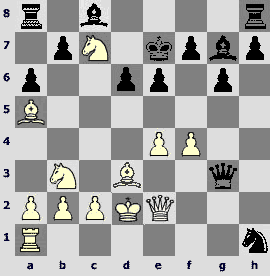 In the variation 19...Јxa2 20.¦xd7 Јa1+ 21.ўd2 Јxb2+ 22.ўe3 Јc3+ 23.ўf4ќ white king manages to leave the dangerous zone. 20.Јxe4+ ўd8 21.Ґxd7 Ґxd7. In case of 21...¦xd7 22.Ґf4 Black has no adequate defense against 23.Јa8+. 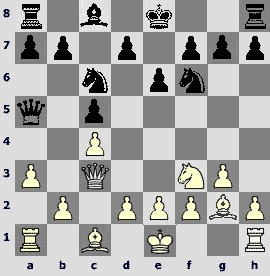 White pieces are obviously better centralized than their black counterparts; besides, there is a threat of bishop's lunge on a5. All in all, Black is not to be envied. 16...e6! Throwing himself into an abyss of boundless complications that have led to an absolutely uncommon, fantastic position. 17.Ґa5. Black is not at all happy with 17.Јxg4?! exd5. 23.¤xa8?! After that the white king takes a risky journey. It was safer to choose 23.¦xh1 Јxf4+ 24.ўd1 ¦b8 25.Ґd2! 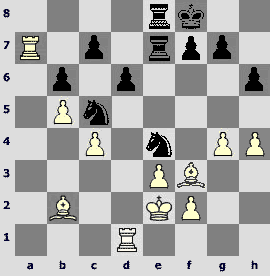 Јg3 26.Ґe1 Јf4 27.Ґd2= with a problem-like move repetition; Black can also try 23...¦b8! ?, though. 23...Јxf4+ 24.Јe3 Јh2+ 25.Јe2 Јf4+ 26.Јe3 Јh2+ 27.Јe2 Ґh6+ 28.ўc3. Practically forced, as 28.ўd1? Јg1+ 29.Јe1 Јg4+ 30.Ґe2 (30.Јe2 e5! 31.Јxg4 Ґxg4+ 32.Ґe2 ¦xa8 33.Ґxg4 ¤f2+ 34.ўe2 ¤xg4°) 30...Јxe4µ is bad. 31...d5! 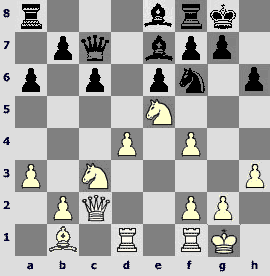 It well may be that White should be able to play his "trumps" here (he is still a piece up), but in practice to play such a position with Black is much easier, and the following course of events proves that. 32.ўa4? Probably only a good computer is able to venture a move 32.exd5! Јd6+ 33.ўc4! (33.ўa4 Ґd7+ 34.¤xd7 b5+°) 33...Јf4+ 34.ўc5 Ґd7 (threatening 35...Јd6+ 36.ўc4 Ґb5#) 35.a4! (strictly the only move) 35...Ґxb2 36.¦b1›. 35...Јxb2? A very fine win is 35...¤xe4! 36.Ґxe4 Јxb2! 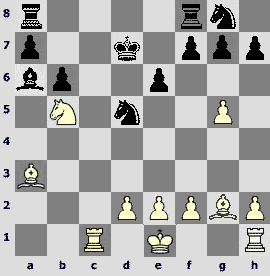 37.¦b1 (every other move will be of no help either) 37...¦c8! 38.Ґc5 (38.¦xb2 ¦c4+ и 39...¦a4#) 38...Ґc3+! 39.Јxc3 a5+°. 38.Ґc5? A decisive mistake. 38.c4 ¤e4!° does not help either, but White should have played 38.Ґxb5+! axb5 39.exf7+ ўxf7 40.Јxg3 Јc3+ 41.Јxc3 Ґxc3+ 42.ўxb5 Ґxa1 43.¤xa1 h5 with a complex ending in which black chances are somewhat better. 5. A breakthrough in the center. 17.d5! After such a move has already been made, everything becomes clear, but it is not so easy to find it. Breakthrough in the center is a complete surprise for Black. 17...¦d8. On every capture with a pawn 18.¤xd5! decides the issue. 18.¦fe1 ўh8 19.dxe6 ¦xd1 20.¦xd1 fxe6 21.¤e4 g6 22.¤c5ќ. 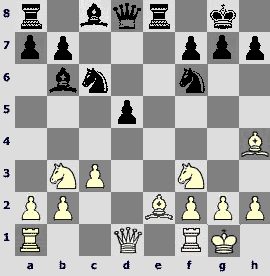 White has a decisive positional advantage. 29.e5! Taking advantage of the fact that the e5-square is not blockaded. A typical liberating pawn sacrifice. 29...¦xe5. There is no hope for Black in 29...fxe5 30.Ґxc5 ¦xf1+ 31.¦xf1 ¤xc5 32.Ґxh7 ўxh7 33.Јxg5 or 29...dxe5 30.Ґxh7 ўxh7 31.¤e4 (weak f6-pawn ruins Black) 31...Ґxf2 32.¦xf2 ¦ef8 33.¦ef1 ўg7 34.¦xf6 ¦xf6 35.Јxg5+ ¦g6 36.Јe7+. 30.¦xe5 fxe5 (30...dxe5 31.Ґxh7 ўxh7 32.¤e4 Ґxf2 33.¦xf2ќ) 31.Ґxh7 ўxh7 32.Јxg5 Ґxf2 33.¤xf2ќ with a won position for White. 28.e4! An unexpected breakthrough in the center practically drives Black in a corner. 28...¤b5. All the other continuations are no better: 28...dxe4 29.d5! Ґxd5 (29...Ґb5 30.fxe4±) 30.¦ad1±; 28...h5 29.exd5 Ґxd5 30.¤e3 ¤b5 31.Јd2±. 29.Јd2 h5 30.¤e3 dxe4 31.d5 f5 (31...exf3? 32.Ґf5ќ;31...¤g5 32.h4±) 32.¤xf5! Јxd5. On 32...exf3 very strong is 33.Јb4!ќ. Black could have offer a more stubborn resistance after 32...Ґxd5 33.fxe4 Ґe6 34.Јxd7 Ґxd7 35.e5±, although the evaluation of this position is obvious. 33.Јxd5+ Ґxd5 34.Ґa4 a6 35.Ґxb5 axb5 36.fxe4! Ґc6 37.¤d6ќ, and White won. 12.d5! Taking advantage of Black's delay in castling White gets down to serious business. 12...b4. After 12...exd5 13.Ґg5 bad is 13...O-O? in view of 14.Јd3 g6 15.¦xe7!ќ, and in case of 12...¤xd5 there follows 13.¤xd5 Јxd5 14.Ґd2! Јd8 15.Ґe4±. 14.Ґf4! Maintaining the pace of the attack. 14...bxc3. Neither14...exd5 15.¤e2± nor 14...¤xd5 15.¤xd5 Јxd5 16.Јxd5 exd5 17.¦ac1 solves any problem, although it has been worthwhile to take under control the d6-square by way of 14...¤c4!? 16.dxe7+ Јxe7 17.Ґe5±. Only for a single pawn White has acquired the strongest initiative. 20.Ґxg7+! 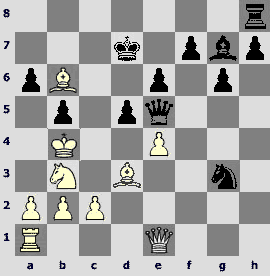 A simple combination gives a decisive material advantage to White. 15.d5! A positional pawn sacrifice. White liberates communications for his pieces and then calmly builds up the pressure. 15...Ґxd5. 15...¤xd5 16.¤xd5 Ґxd5 17.¦xd5! does not change anything- see next commentary. 16.¤xd5 exd5. It is important that on 16...¤xd5 there is 17.¦xd5! exd5 (17...Јxd5 18.Ґxe7 ¦xe7 19.Јh4ќ) 18.Ґxh7+ ўxh7 19.Јh4+ ўg8 (19...ўg6 20.¤e5+ ўf5 21.Јg4+ ўxe5 22.Ґf4+ќ) 20.Ґxe7 Јxe7 21.¤g5 Јxg5 22.Јxg5±. 17.Јh4 h5. 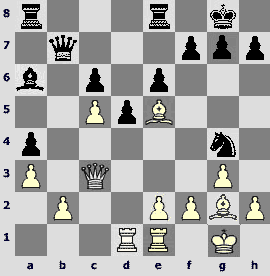 A forced weakening, as both 17...h6? 18.Ґxh6! gxh6 19.Јxh6 ¦c7 (19...¦e8 20.¦d4! Ґf8 21.¦g4+ ¤xg4 22.Јh7#) 20.¤d4 ¦xc2 21.¦d3ќand 17...g6? 18.¦fe1 followed by 19.¦xe7 lose. 18.¦fe1 ¤c6. No problem is solved by 18...Јc8 19.¤d4 Јg4 20.Јxg4 hxg4 21.Ґd2! Ґd8 (21...b4 22.¦xe7 ¦xe7 23.Ґxb4±) 22.Ґb4 ¦e8 23.¦xe8+ ¤xe8 24.Ґf5± - threatens 25.Ґxa5 Ґxa5 26.¤c6; besides, the g4-pawn is under attack. 19.g4! 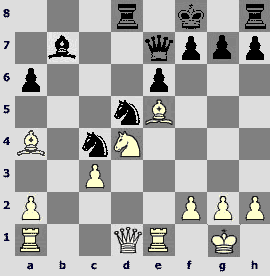 Black king's shelter is obviously unreliable, and White takes advantage of this situation aggressively. 19...Јd6 20.gxh5 Јb4 21.h6! Јxh4 22.¤xh4±. White has acquired a significant positional advantage and brought the game to a win. 27.¤xb7! Far advanced Q-side pawns create the necessary prerequisites for a piece sacrifice which should be carried out under advantageous circumstances. 27.Ґxa6? bxa6 28.¤xa6 ¦c8 29.¤b7 Јd7 is a mistake. 27...¦xb7 28.a5 ¤c6 29.¤xc6 Ґxc6 30.Ґxa6 ¦b8. More hopeful is 30...Јa8 31.Ґxb7 ¦xb7 32.¦a1 Јa6±, although it looks like the blockade of the light squares would not be long. 31.Ґb5! Јc8 32.Ґxc6 Јxc6 33.a6. All the rest is clear without a commentary. 14...¤g4! A positional exchange sacrifice. In return Black gets a bishop pair and fine prospect of developing his initiative on the Q-side. 15.Јf3. 15.Ґxc7?! ¤xe3 looks much too resigned. 15...¤xe5 16.Јxa8 ¤d7! Exactly so, and not 16...¤c6? 17.¤xb5! 17.g3? After the best move 17.Јf3 Ґb7 18.Јg3 b4 19.¤e2 O-O© Black has adequate compensation for an exchange. 19...f5! 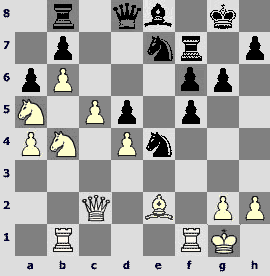 20.Јh5+ ўf8 21.¤f2 Ґf6 22.Ґd3 ¤a4µ, and White is in a critical situation. 9.b4! It is impossible to get a tangible advantage without opening up the play. Activation of the dark-squared bishop that does not have an opponent is well worth of a pawn. 9...cxb4 10.axb4 Јxb4 11.Јxb4! Strange as it may seem, even in the absence of queens white initiative is very strong. Now it is important not to lose tempi. Not so clear is 11.Јc2 O-O 12.Ґa3 Јa5›. 11...¤xb4 12.¤d4! Dark square weaknesses do not let the opponent live without worries. White's achievements have become obvious. 21.¤c7! 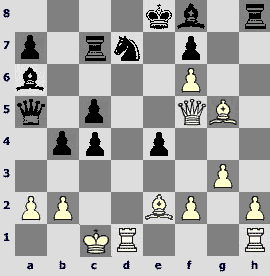 A decisive blow – Black is down an exchange. 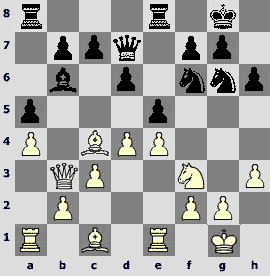 21...Ґb7 (21...¤xc7 22.Ґc6+!ќ) 22.¤xd5 Ґxd5 23.Ґxd5 exd5 24.Ґxf8 ¦xf8 25.¦g1!, and White has converted his material advantage into a win. White seems to have nothing substantial. But is this really so? 14.¤d2! Knight gets to a5 with tempi, and Black finds himself in difficult straits. 14...¦ab8 15.¤b3 ¦dc8 16.¤a5±. Now on 16...¦c7 there is a very strong answer 17.Ґf4! e5 18.Ґe3±. During the game Black chose 16...Ґc6, resigning himself to chronic pawn weaknesses. White has great spatial advantage. His opponent's minor pieces are extremely unsuccessfully situated, but the only open line is in Black's hand. 22.¤b3! 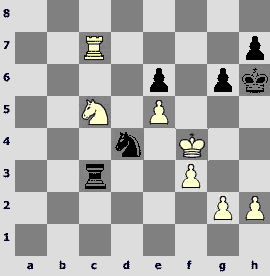 An unexpected knight maneuver stresses a clumsy position of a black rook. Now threatens 23.¤d2 ¦4e7 24.Ґxf6. Straightforward 22.¤de6? fxe6 23.Ґxf6 wouldn't work in view of 23...¦xf4!µ. 23.¤d2 gxf4 (23...¦xf4 24.gxf4 ¤h5 25.ўh1 ¤xf4 26.Јc3ќ) 24.Ґxf6 ¦e2 25.Ґc3! Јg4. If 25...¦8e3 26.Јd4 f6, then 27.¦de1 ¦xe1 28.fxe3± or even 27.¦c1! counting on 27...Јf5 28.Јxf4 Јxf4 29.gxf4 ¦xc3 30.¦xc3 ¦xd2 31.¦e3 ўf7 32.¦fe1ќ. 27.¦de1! 27.Јxf4?! 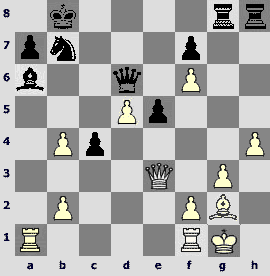 Јxf4 28.gxf4 ¦8e3 leads to unclear play. 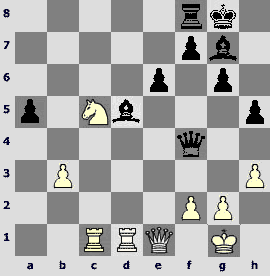 Having precisely calculated the variations White neutralizes his opponent's activity and gets a winning position. 25.¤d1! Clearing the way for the queen and stressing the faults of black pawn structure. 25...g6? Underestimation of white idea rapidly leads to a difficult position. Prophylactic 25...Јd6! 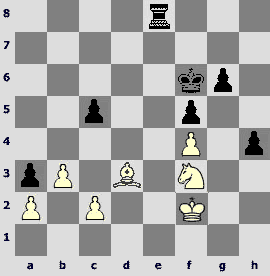 is stronger, but then White has a resource 26.Јa5. 26.Јb4 ¤d7. 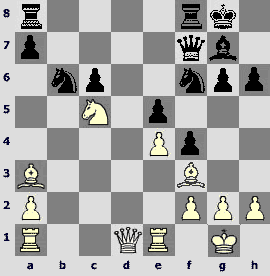 After other moves Black also has evident difficulties: 26...Јd8 27.¤c3±;26...¦xe3 27.¤xe3 Јd8 28.¤g4! h5 29.¤e5±. 27.Ґb5! ¦xe3 28.¤xe3 ¤f6?! On 28...Јa7 would follow 29.¤xd5ќ. More stubborn is 28...¤b6 29.¤g4±. 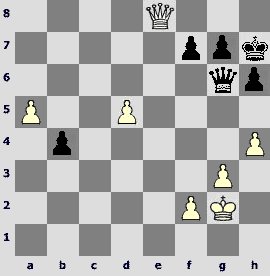 29.Ґxa4 Ґxa4 30.Јxa4ќ, and White converted his extra pawn. 29...Ґd8! 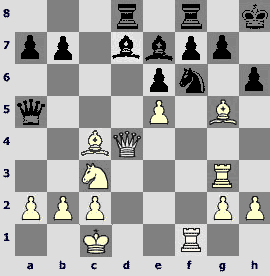 The bishop comes to a weakened b8-h2 diagonal, which leads to the decisive threats to white king. 30.Ґg2.If 30.Ґxd5, then 30...Ґc7 31.f4 ¦e3 32.Ґxc6 Јxc6 33.d5 ¦g3+ 34.ўh2 ¦ee3! 35.dxc6 ¦xh3+ 36.ўg2 ¦eg3+ 37.ўf2 ¦h2+ 38.ўe1 ¦e3+ 39.¤e2 ¦hxe2#. More stubborn is 30.¤xd5, though after 30...Ґxd5 31.Јxd5 Јf4 32.ўg2 Ґc7 33.¦h1 ¦f6 34.¦de1 ¦xe1 35.¦xe1 Јh2+ 36.ўf1 Ґg3 37.¦e2 (37.fxg3? hxg3) 37...Јxh3+ White is not exactly happy. 30...Јf4 31.¦c1 Ґc7 32.¦fd1 ¦f6! 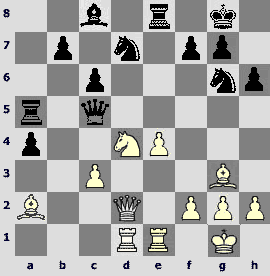 A standard method – trying to defend himself from checkmate White has been forced to cede control over the f2-pawn. 33.Јc2 ¦e3! With an idea of 34...Јh2+ 35.ўf1 ¦g3! 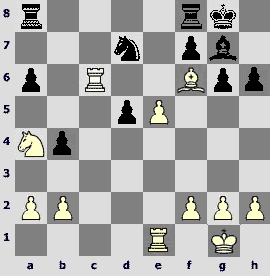 White has an excellent compensation for the offered pawn, but how to develop the initiative? 23.Јc1! To give an answer to this question we have to determine, which white piece stands badly. Alltherestissimple. 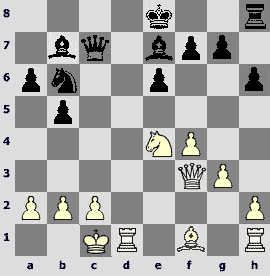 The bishop goes from f3 to b3, and black position becomes very difficult. 23...Јc4 24.Ґd1! Queen exchange fails to solve black problems. 24...Јxc1 25.¦xc1 ¦fc8 26.Ґb3+ ўh7 27.¤e6 a5 28.¤xg7 ўxg7 29.Ґe6 ¤bd7 30.¦ed1± with an indisputable white advantage. 12.Ґb4! 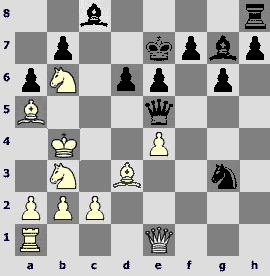 A clumsy-looking move, but White's paramount task is to keep the dark-squared bishop from being exchanged. This game is an excellent textbook example on utilizing the pair ob bishops. 12...Ґd7. If 12...c5 or 12...a5, then 13.Ґa3, and after b2-b3 bishop returns on the long diagonal. 13.¤e5! ¤6c5? It seems worthwhile to try and change the character of the struggle by way of 13...Јf6 14.Ґxe4 Јxe5 15.Ґxb7 Јxb2 (15...¦ab8? 16.Ґc3) 16.¦b1 Јxa2 17.Ґxa8 ¦xa8. Now White has an obvious advantage. 25.g4! White occupies the space on both flanks and then carries out the decisive opening of the files. 32.b5! A-file is more important than c5-square. 36.g5! 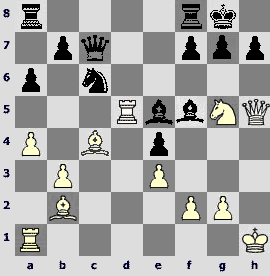 Offering a pawn White strengthens his c6-bishop and occupies another outermost file. The final stage of the game reminds me of an immortal masterpiece Lasker – Capablanka, St.Petersburg 1914. 16.Ґxe6! fxe6 17.Ґxf6! Ґxf6 18.f4! Having got rid of the excessive pieces and fixed the position in the center White prepares the final pawn storm on the K-side. Black is completely defenseless. 10. A mysterious rook move. White position looks a bit more pleasant due to the spatial advantage on the Q-side, but how can he strengthen his position? 20.¦b1! An ingenious move. The rook leaves the open file, now it has some more important tasks. The b3-square, which is to be a destination point for the knight, ought to be taken under control in advance. Immediate 20.¤b3 would run against 20...b6! 20...b6. Neither 20...Ґh6 21.Ґxh6 ¤xh6 22.¤b3І nor 20...f5 21.exf5 gxf5 22.f4 Ґh6 23.g3І can solve all the problems. 21.c5! b5 22.a4 bxa4?! 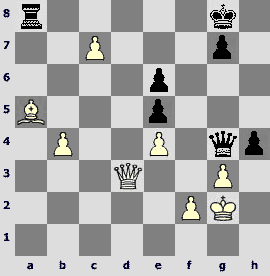 Relatively better is 22...a6 23.¤b3 Ґxb3 24.¦xb3 Ґh6 25.Ґxh6 ¤xh6 26.¦a3І, But even in this case White keeps the pressure. 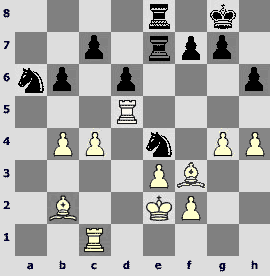 23.¤xa4 f5 24.exf5 gxf5 25.¤c4 ¤d5 26.Ґd2 e4 27.¤a5±, and White converted his positional advantage into a win. 11. Defense of difficult positions. White has material advantage. 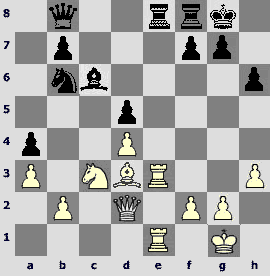 Black pawns are weak, passive defense in such cases is absolutely hopeless. 50...¦d8! 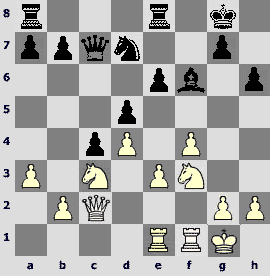 Black counterplay can consist only in invading the enemy camp with his rook, and then the a3-pawn will become a source of trouble for White. 51.¤xh4. If 51.ўg2, then 51...¦e8, and the king has to return. 51...c4! Now the rook assuredly invades along one of the files. 52.bxc4 ¦b8 53.c5 ¦b2 54.c6 ўe7 55.¤xg6+ ўd6 56.¤e5 ¦xa2. The position has sharpened. Considering the passed pawns on both sides the chances are even. 57.¤c4+ ўc7 58.ўg3 (58.Ґxf5? ¦xc2+!) 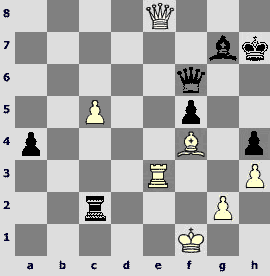 58...¦a1 59.¤xa3 ¦xa3 60.ўh4 ўxc6 61.ўg5 ¦a5 62.Ґxf5 ўd6, and soon the game ended in a draw. Major piece endings conceal quite a few drawish tendencies, and this game is a proof of it. It seems that Black, being two pawns down, can hope only for perpetual check. 67...Јc1! 68.d5!? After 68.Јxd8 Јh1+ 69.ўg3 white king reckons on finding shelter from checks, but it is helpless against fantastic 69...Јxf3+! with stalemate. In case of 68.¦xg7+ ўxg7 69.Јxd8 Јh1+ 70.ўg3 Јg1+ 71.ўf4 Јc1+ 72.ўe4 Јc6+ it is impossible to escape from pursuit. 68...Јf4! (68...¦xd5? 69.¦xg7+ ўxg7 70.Јb7+ ўh8 71.Јxd5ќ) 69.ўg2. 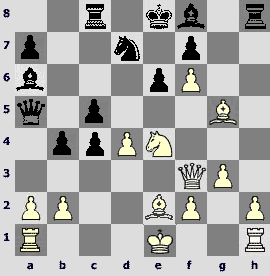 In the variation 69.Јb3 ¦b8 70.Јe3 Јd6 71.Јa7 ¦g8 Black also manages to save himself. 69...¦c8! Having activated his pieces Black draws without too much efforts. White pieces are very active. Black has to think about leveling. 22...¤xe5! Tactics to the rescue. After 22...Ґxf6 23.exf6 ¦fe8 24.ўf1 ¦xe1+ 25.ўxe1 ¦e8+ 26.ўd1 ¦e6 27.¦c8+ ўh7 28.¦c7 Black would have faced a defense in an unpleasant endgame. 23.Ґxe5. Practically forced way to a draw. 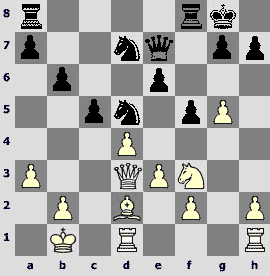 Careless 23.¦xe5 allowed to carry out the principal idea: 23...¦ac8! 24.Ґxg7 ¦xc6 25.Ґxh6 g5! 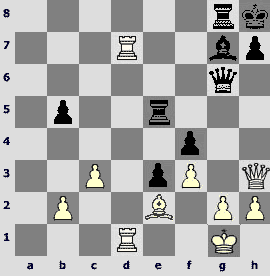 26.Ґxg5 f6 27.¦xd5 fxg5 28.¦xg5+ ўh7 29.f3 ¦d8, and White is only one with problems here. It seems that the clouds are gathering over Black's position. 16...Ґe8! The f7-square demands redundant defense. It is evident from the variation 16...Ґc6 17.exf6! ¦xd4 18.fxg7+ ўg8 (18...ўh7 19.gxf8Ј Ґxf8 20.¦xf7+ ўg6 21.¦f6+ ўh7 22.Ґe3ќ) 19.Ґxe7 ¦e8 20.Ґxe6! Јh5 (20...¦xe7 21.¦xf7!ќ) 21.Ґxf7+ (or 21.¦f5!? ¦xe7 22.¦xh5±) 21...Јxf7 22.¦xf7 ўxf7 23.b4!±. 17.Јf4?! Of no use is 17.exf6 ¦xd4 18.fxg7+ ўh7 19.Ґxe7 ¦g8µ, on 17.Јh4 will follow 17...Јxe5 18.Ґxh6? gxh6 19.Јxh6+ ¤h7, and in case of 17.Јe3!? in stock is 17...¤g4! 18.¦xg4 Ґxg5 19.¦xg5 hxg5 20.Јxg5 Ґc6 21.Ґd3 ўg8, and compensation for offered exchange is inadequate. 17...¤h5 18.Ґxh6? A fine but incorrect idea. Objectively the lesser of two evils is 18.Јh4 ¤xg3 19.Ґxe7 ¤xf1 20.Ґxd8 (20.Ґf6? ¦d1+! 21.ўxd1 ¤e3+ 22.ўc1 ¤f5°) 20...Јxe5 21.Ґxf1 Ґc6 with black initiative. 21...¦xg7? Instantly winning is 21...Јxc3! 22.¦xc3 (22.bxc3 Ґa3+ 23.ўb1 ¦d1#) 22...¦xg7°. Now the game ends in a draw. The impression is that things look bad for Black. The white pawn is already on c7, and there seems to be no counterplay on the K-side. 55...ўh7! King is withdrawn to a safe square, and now the rook takes a journey via a8-f8-f3. To calculate all the consequences at the board doesn't seem possible, but Black has no other way out. 56.Ґb6. 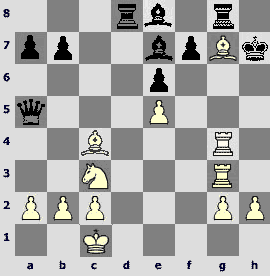 During the analysis it has been established that 56.b5 ¦f8 57.Ґe1 ¦f3 58.Јc2 (58.Јd8 hxg3 59.fxg3 ¦f7=) 58...¦f7! 59.f4 (59.ўh2? Јf3! 60.c8Ј h3 61.ўxh3 Јh1+ 62.ўg4 g6!°; 59.c8Ј h3+ 60.ўf1 Јxg3 61.Ј2c3 Јg2+ 62.ўe2 h2 63.Јxe6 h1Ј 64.Јxf7 Јxe4+ 65.Јe3 Јc2+ 66.Јd2 Јhe4+=; 59.ўg1 Јf3 60.gxh4 Јg4+ 61.ўf1 ¦f3 62.Јd1 Јh3+ 63.ўe2 Јg4=) 59...exf4 60.c8Ј fxg3 61.Ј8c4 Јf3+ 62.ўg1 Јe3+= also leads to a draw. 56...¦f8 57.Ґc5. In case of 57.ўh2 Јh5! 58.gxh4 ¦f3 59.Јxf3 Јxf3 60.c8ЈЈf4+ there is a perpetual check. 57...¦f3! 58.Јb1 ¦xg3+. Computer finds another decision in a trice: 58...hxg3 59.Јh1+ ўg6 60.c8ЈЈxe4!=. 27...ўh7! Self-suggesting is 27...a5, but in this case after 28.a3! ¤a4 29.¦xc8+ Јxc8 30.Јb3 Јc1+ 31.ўh2 Јxa3 32.Јd5 the black K-side becomes vulnerable, so in the first place he should take care of the king's safety. 28.¦a1. Neither 28.Јxb4? ¤xa2 nor 28.a3? ¤a4 is possible. 28...a5 29.Јb3?! Јxb3 30.axb3 g5 31.Ґg3 a4! 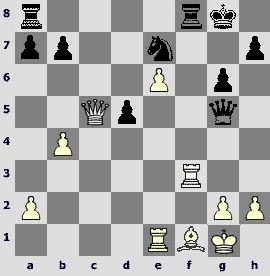 32.¤d2 a3 33.¦c1 e5!°, and Black went on to win soon. 16...h5! Pawn sacrifice based on prophylactics. It appears that in order to tie up white play on the Q-side it is necessary to pay no attention to the threat to the c5-pawn. 17.bxc5 b5! 18.¤b2 g5. Black initiative on the K-side develops appreciably faster. 19.d4?! After more logical 19.a4 the variation 19...g4! 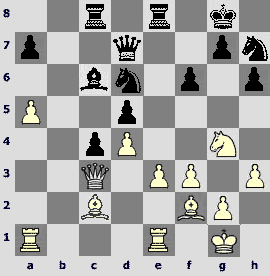 20.fxg4 hxg4 21.¤xg4 ¤g5 with strong black attack should be seriously taken into consideration. 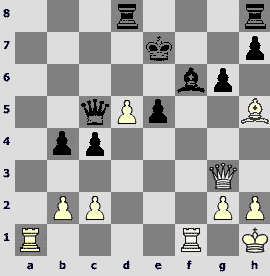 19...exd4 20.¤d3 ¤xc5 21.¤xc5 Јxc5 22.¦fd1 Ґe6µ with unquestionable black advantage. At first glance White has a stable advantage. His pieces stand more actively, the e6-pawn noticeably fixes the opponent's forces, and the black monarch doesn't feel safe at that. But it's not easy to fit a key to this position – Black intends to move his queen on b6 or d6, and then to bring up the Q-side rook. 22.Јd4! A paradoxical and really difficult decision. This is the only way to maintain the initiative. 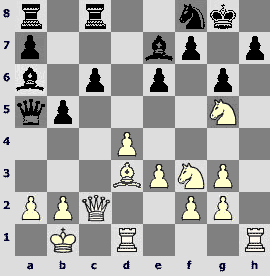 White seems to overlook the fork, but he really hampers the black plan and is going to suggest exchanging queens. Banal 22.¦h3?! is unpromising due to 22...Јb6+ 23.ўh1 (23.Јe3 Јxb4 24.Јh6 Јd4+ 25.ўh1 Јg7) 23...Јxe6! 22...Јd6. On 22...Јb6 would follow 23.Јc5! anyway, and after 22...¤f5?! 23.Јe5 one should not play 23...¤xe3? because of 24.e7 ¦xf1+ 25.¦xf1 Јb6 26.¦f8+!? ¦xf8 27.Јh8+ ўxg8 28.exf8Ј#. 23.Јc5! Јf4? Relatively better is 23...¦ad8 24.Јxd6 ¦xd6 25.¦c1, or 23...Јxc5 24.bxc5 ¦fc8 25.¦b1, although in both cases the ending is somewhat better for White. 25.¦f7! 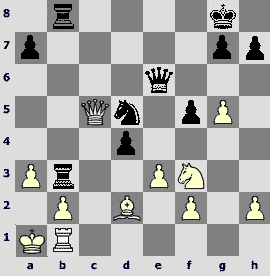 ¦xf7 26.exf7+ ўxf7 27.Јc7!±, and White's advantage is already unquestionable. 13. Converting an advantage into a win in simple positions. 28.Ґxf7! A most skilled way of converting an extra exchange. White transfers the game into a winning ending with two rooks against the queen. 31.¦xc7 Јd3?! 31...a5 32.¦cc1 a4 33.¦a1 Јb3 34.f3! with an idea of 35.¦f2 and 36.¦fa2 drags out the resistance a bit. The first impression is that Black has managed to build an impenetrable fortress. 46.Ґf6! 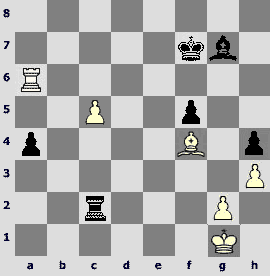 White demonstrates a study-like way to win. Sacrificing a piece he creates a passed h-pawn. 46...g6. 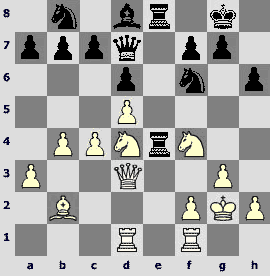 White wins gracefully in case of 46...gxf6 47.exf6 ¦c8 48.¦xc8 ўxc8 49.ўg5 ўd7 (49...¤d4 50.h6 ¤f3+ 51.ўh5 ¤e5 52.h7 ¤g6 53.ўh6 ўd7 54.ўg7ќ) 50.h6 ¤xh6 51.ўxh6 e5 52.ўh7! with unavoidable zugzwang: 52...e4 53.ўg7 ўe6 54.a3ќor 52...a3 53.ўg7 ўe6 54.f3ќ. 42.g4! White departs with his extra pawn but forces his opponent to transpose the game into a difficult knight ending. 42...g5+. The only move. Losing is 42...¤xf3? 43.¤xe6 ¦xc7 44.¤xc7 ¤xh2 45.e6 and 42...¦xf3+? 43.ўe4 ¤b5 44.¦b7. 43.ўe4 ¤xf3 44.¤xe6 ¦xc7 45.¤xc7 ¤xh2 46.ўf5 ¤xg4?! An interesting attempt met with a study-like rebuttal. On 46...¤f3?! there would follow not 47.e6? ¤d4+ 48.ўe5 ¤xe6! 49.¤xe6 ўg6=, but 47.¤e8! ¤d4+ 48.ўf6ќ. More stubborn will be 46...ўg7 47.¤e6+ ўg8 48.¤xg5±. 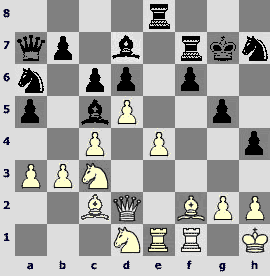 White is a pawn up, but black pieces are active. Besides, the Q-side pawns are vulnerable. 21.f4! Of no help is 21.0-0 ¦c2 22.¦d1 d4 23.Ґe3!? 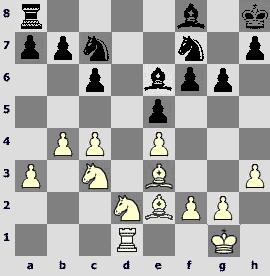 g6 24.Ґxd4 Ґxd4 25.¦xd4 ¦xa2 26.e3 a5, and in case of 21.ўd1 or 21.e3 a strong reply is 21...Ґa3 with subsequent rook attack on a2 and b4-pawns. After 21.f4! 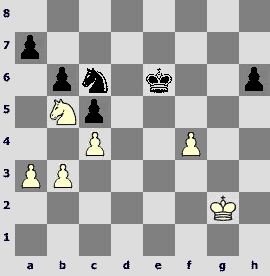 White seeks to achieve an advantageous rook endgame and prepare rook's joining the battle along the third rank. 21...Ґa3. If 21...¦c6 then 22.ўd1!, and it is pointless for Black to play 22...¦a6? because of 23.ўc2! 22.¦f1! ¦c4 (22...¦c2 23.¦f3 ¦xa2 24.¦d3±) 23.¦f3 Ґxb4 24.Ґxb4 ¦xb4 25.¦a3 h5! The only salvation for Black is active defense. Hopeless is 25...¦b7? 26.¦a5 ¦d7 27.ўd2 ўf8 28.ўd3 ўe7 29.ўd4 ўe6 30.g4ќ. 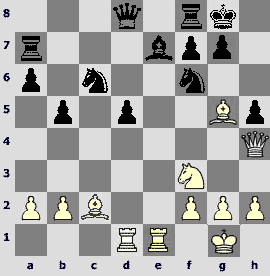 26.¦xa7±, and White went on to win the game. 31.e5! A precisely calculated way to win. 31...fxe5. On 31...¦xd5 32.¦b7+ ўh6 (32...ўh8 33.ўg6 Ґh5+ 34.ўxh5 ¦xd3 35.ўg6 ¦d8 36.¦h7+ ўg8 37.exf6ќ) the outcome is decided by the subtle 33.Ґb1! ¦c5 (33...fxe5 34.ўe6ќ; 33...¦xe5+ 34.ўxf6ќ; 33...¦d8 34.e6 f3 35.ўxf6 ¦f8+ 36.¦f7ќ) 34.ўxf6 Ґc2 (34...ўh5 35.e6ќ) 35.Ґxc2 ¦xc2 36.e6 ¦xg2 37.e7 ¦e2 38.¦b2 ¦xb2 39.e8Ј ¦b6+ 40.ўf5ќ. 32.ўxe5 f3 33.gxf3 Ґxf3 34.d6. Passed d-pawn decides the issue. Remote passed pawn and more active king's position define White's advantage, but in pawn endings general estimation should be backed with precise calculation of variations. 30.f5! 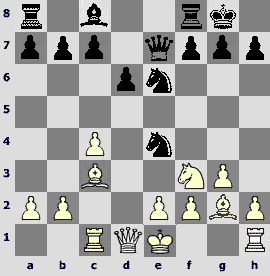 ўd6 (30...exf5 31.ўd5ќ) 31.fxe6 ўxe6 32.ўd4 ўf5.Or 32...f5 33.e4! 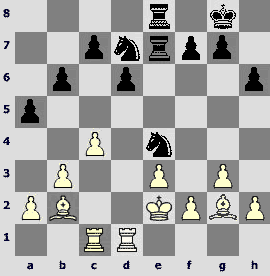 f4 (33...fxe4 34.ўxe4 b5 35.ўd4 ўd6 36.h4) 34.h4 b5 35.h5 ўf6 36.e5+. 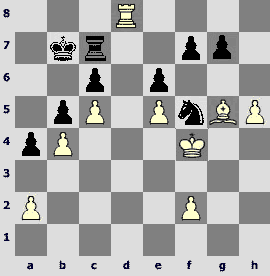 Spatial advantage is of great importance in knight endgames, but will it be enough for victory? 33...ўf7 34.g4. 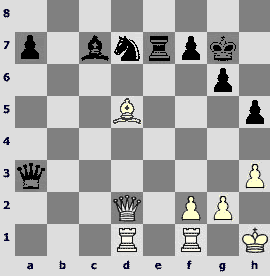 Black is not afraid of 34.¤b5, having in mind 34...a5 35.a4 (35.¤d6+?! ўe6 36.¤c8 a4!°) 35...¤f3! 36.g4 (36.¤d6+ ўe6 37.¤c8 ¤d2 38.¤xb6 ¤xb3 39.ўf1 ¤d2+ 40.ўe2 ¤f3µ) 36...¤d2 37.gxf5 (37.¤d6+ ўe6 38.¤xf5 ¤xb3 39.¤xh6 ¤d2µ) 37...ўf6 38.¤d6 h5 39.ўg3 ўe5 40.¤c8 ўxf5µ with good chances to win. 36...ўe6. Black has acquired a remote passed pawn. 40...h5! 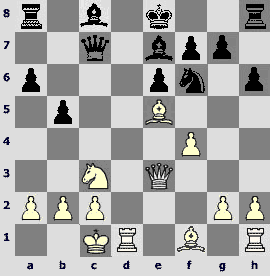 Making it impossible for White to centralize his king: 41.ўf3? ¤d4+°. To win it is necessary to get to g3-pawn with the king. The only way to do this is zugzwang. 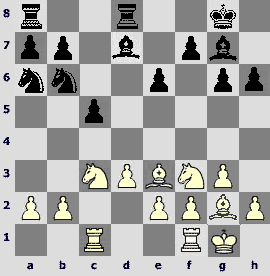 The bishop should occupy the c1-h6 diagonal, depriving white king of his mobility. 63...Ґa3! This move is stronger than 63...Ґb4 64.ўe3 Ґd2+ 65.ўd3 Ґc1 66.Ґe3!, and bishops exchange leads to a drawn pawn ending. 51...h4! 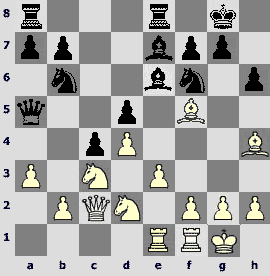 It is necessary to fix the white pawn on g2. To a draw leads 51...e4 52.g3+! ўe5 53.a6 h4 54.¦a5+ ўf6 55.gxh4 gxh4 56.ўd4=. 52...e4 53.ўd4. 53.¦a2! creates more difficulties. In this case Black is just in time to win nevertheless: 53...g4! (53...ўg3 54.ўd4=) 54.hxg4 fxg4 55.ўb5 ўg3 56.ўb6 ¦a8 57.ўb7 ¦h8 58.a7 e3 59.a8Ј (59.¦e2 ўh2 60.¦xe3 ¦h7+! 61.ўb6 ¦xa7 62.ўxa7 ўxg2°) 59...¦xa8 60.ўxa8 ўh2! 61.ўb7 g3 62.ўc6 h3 63.gxh3+ g2 64.ўd5 ўh1!°. Converting an extra pawn in queen endings is usually related with technical difficulties. This position is no exception. 45.d6! The only decision that guarantees to White a hundred-percent win. In case of "reliable" 45.a6 Јxa6 46.Јe4+ g6 47.Јxb4 Black retains chances for a draw. 45...b3. 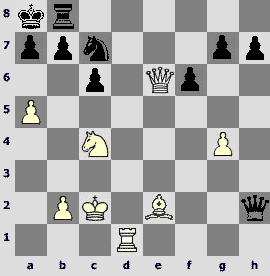 The essence of white idea is clear from the variation 45...Јxd6 46.Јe4+! f5!? (46...Јg6 47.Јb7! b3 48.Јxb3ќ) 47.Јb7! f4 48.a6 fxg3 49.a7ќ. An attentive reader has, of course, noticed the absence of fragments from the games between Vladimir Kramnik and Garry Kasparov. Itisnomerechance. The final part of our essay on Vladimir's creative work will be devoted to the contest of those two splendid chessplayers.